Whoever is launching a website but does not want to spend a dime doing it, these free mobile-friendly website templates are the way to go. Indeed, in the mobile-first era we are living, if a website is not responsive, your web presence, and project in general, might not have the best future ahead of it. You undoubtedly will not see the results you want. Search engines will not like your page and rank it poorly what call for barely any organic traffic. Moreover, everyone browsing from their smartphones and tablets will be clicking the back button in an instant. And that, my friends, is something you sure do not want for your website and online project. To avoid the bad site performance and poor user experience for mobile users, pick any from the below free mobile-friendly website templates. They vary quite a lot and that is a good thing. We are not all here with the same intention to build the exact identical website. That said, you will find tools to craft law, medical, charity, music, agency and other types of websites. Use these responsive free templates to showcase your mobile application, advertise your professional services and to start writing a compelling blog. Are you ready to set the bar high? 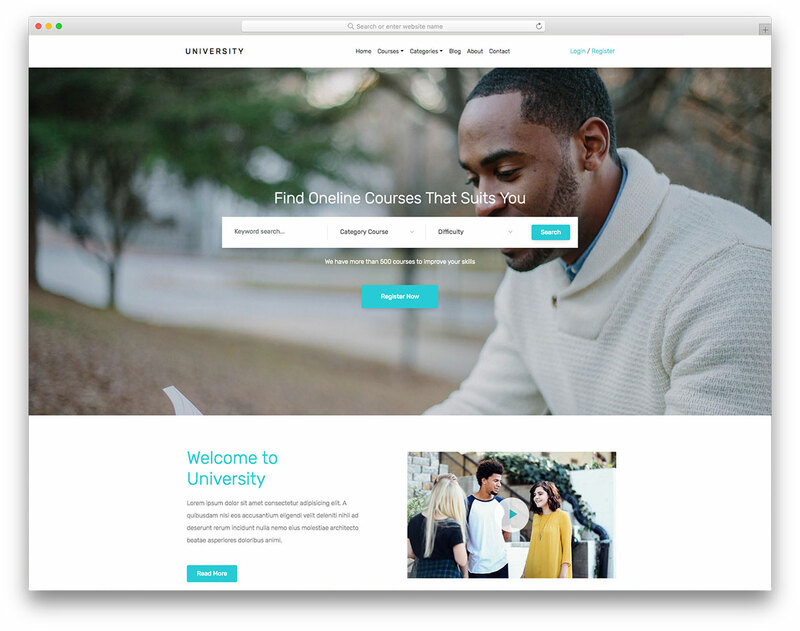 University is a free mobile-friendly website template that you can use for schools, colleges, universities and online courses only businesses. The web design is clean and straightforward, making sure not to distract your users and deliver them a solid experience. Keeping things simple and to the point is somehow the best option to go with every time you are in doubt about how your web design should actually look. In fact, this style of websites is always the winning option. It might be a free template, but University offers many advanced features for you to utilize. With the full-screen banner that combines parallax effect and a courses search feature, you will entice all your site guests. They might not register just yet but they surely will keep on browsing your page and see what you have to offer them. Get your online education platform going today with University and forget about all the rest. Regardless of what item you choose from this collection, it is a guarantee that you will create a responsive and flexible website. Sparsh is a free mobile-ready website template for architects and agencies. You can use it for construction businesses as well without hassle. With Sparsh’s dark layout, you can promote your professionalism and remarkable works in an elegant way. No doubt, when they land on your website, Sparsh will take care of all the rest. In short, when you couple your services and creations with the web design, you will engage everyone’s attention easily. From slideshow and projects page to social media icons and newsletter subscription widget, this and loads more is what Sparsh treats you to. Take it to your advantage, shine online and start scaling your business to new success levels. 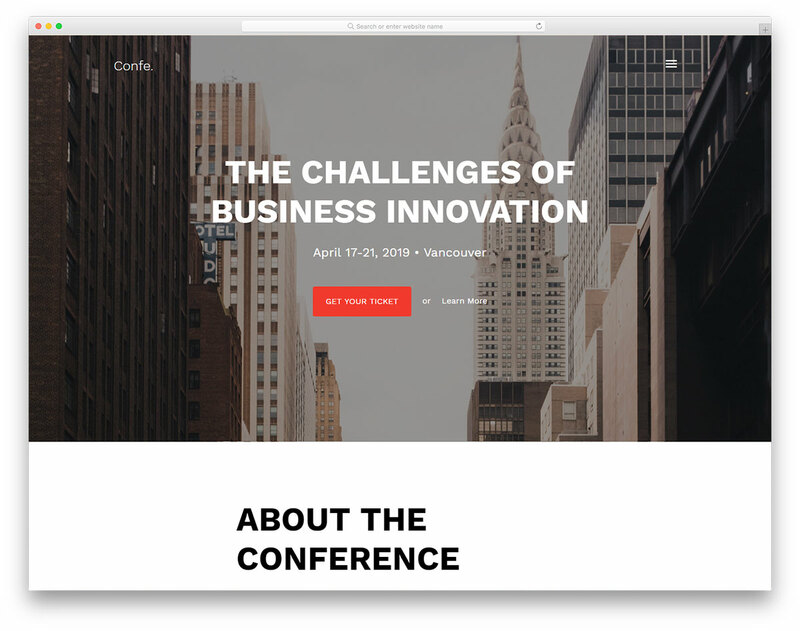 Confe is short for conference and that is what this free mobile-friendly website template is all about. It is a Bootstrap Framework tool that will make your final design fluently adapt to all devices even those with retina screens. Conference, meeting, forum and other gathering hosts are welcome to use Confe and create an online presence that will scream with sophistication and expertness. You can now go in-depth about the happening, introduce all your speakers and boost your potential. A website is also a fantastic place to promote your sponsors and even catch new businesses that are willing to contribute. Moreover, with a web space that you are about to bring to reality with Confe, you can also push tickets and provide all the additional information that will help you sell out the event. 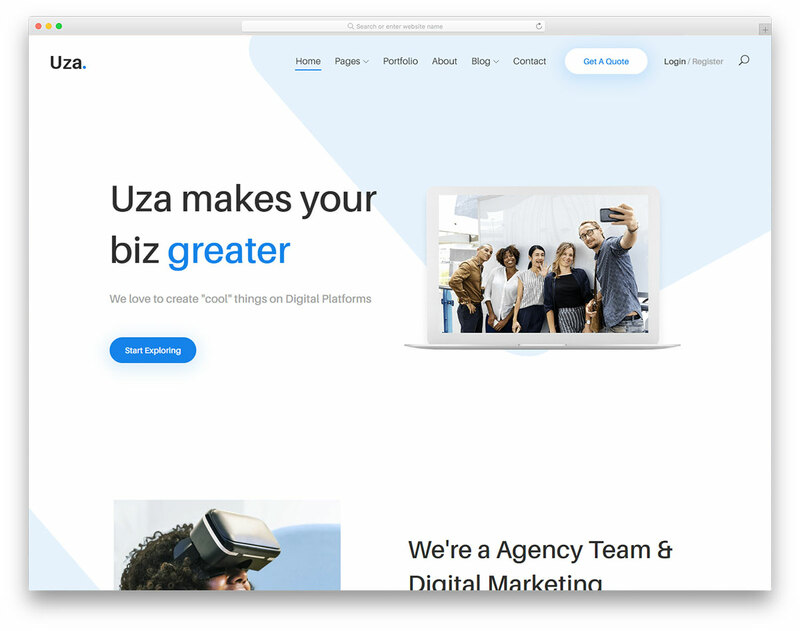 Uza is a versatile free mobile-friendly website template for businesses and agencies. Regardless of the industry, you operate in, Uza is pliable and adaptive enough to adjust to your company needs and regulations with ease. With the clean and contemporary design it sports, you will have no trouble creating an enticing and persuasive website for your business. Add your creative touch to it, change colors, import custom content and customize Uza to the very last detail. With Uza, your expert work will appear even more professional than it already is. Utilize the template to its full extent and enter the online world with a remarkable presence that will spark interest in many online surfers and potential clients. With the number of handy and convenient features, the web design of your website is nearly complete! Nowadays, almost everyone has a tattoo. If it is not an entire sleeve, then she might have a small butterfly inked on her shoulder or a quote on her ribs. With the hype going strong, more and more tattoo shops are opening around the globe on a regular. Sure, Instagram and other social media might be the best option to promote your magnificent work, but do not forget to build a website, too. You can use it for all sorts of intentions to push your talent above and beyond. Tattooz is a remarkable free mobile-ready website template that will sort your out with a neat web space for your tattoo services. The tool comes with three home page styles and an assortment of other internal pages. It is all predesigned and ready for you to put it to use. Tattooz also delivers a pricing table section, includes a working contact form and sports a filterable gallery to persuade everyone with the level of skill you have. Sel is here to expand your real estate business and boost your sales. It is a modern, clean, elegant and stylish free mobile-friendly website template with all the needed to create a brand new page as quickly as possible. No need to look elsewhere if this is the type of a website that you need. Sel has it all packed in one kit for your convenience. From a cracking index page to other inner sections for about, properties, team, blog and contact. Yep, these are all ready-made. Starting with the front page, Sel has a banner with a handy property search option. They can start looking for what they are after without even the need to browse your page in advance. However, they can move further down where you can highlight your top rated properties and even showcase your client’s feedback to build customer loyalty. Start with the right foot forward and use Sel. You kinda get the gist of this next template only by ready its name. It sure is straightforward and self-explanatory. 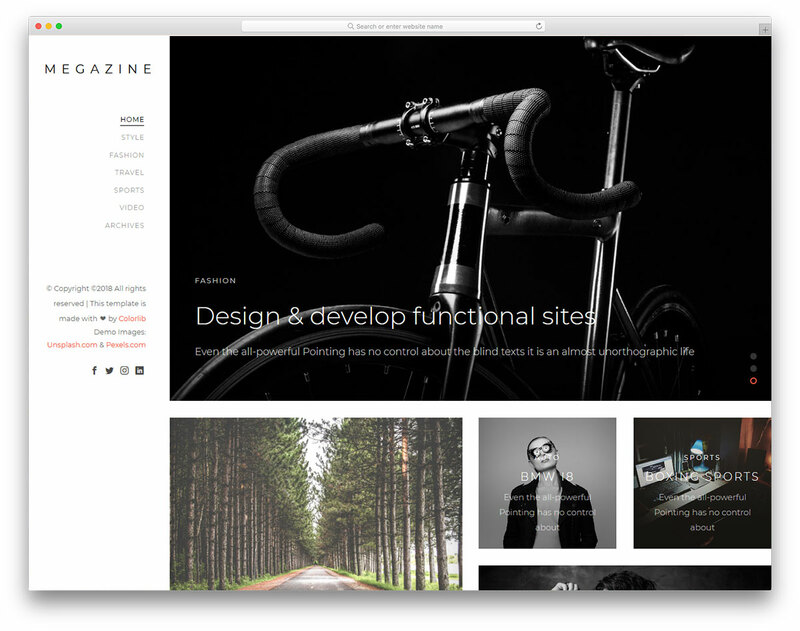 Megazine is a free mobile-ready website template for modern and creative online magazines. If you would like to distinguish yourself from the masses and forge a web mag that stands out, you better consider using Megazine. It is not the type of a web design that you are used seeing when reading a classic online magazine style page. With Megazine, you can do things differently and wow your visitors with something novel. The first thing a guest notices are a sticky sidebar navigation and massive slider. They both create a clean appearance that will get them intrigued and interested to see what are your hot topics. Implement your magnificent and compelling writing skills and you will win them over each and every time. 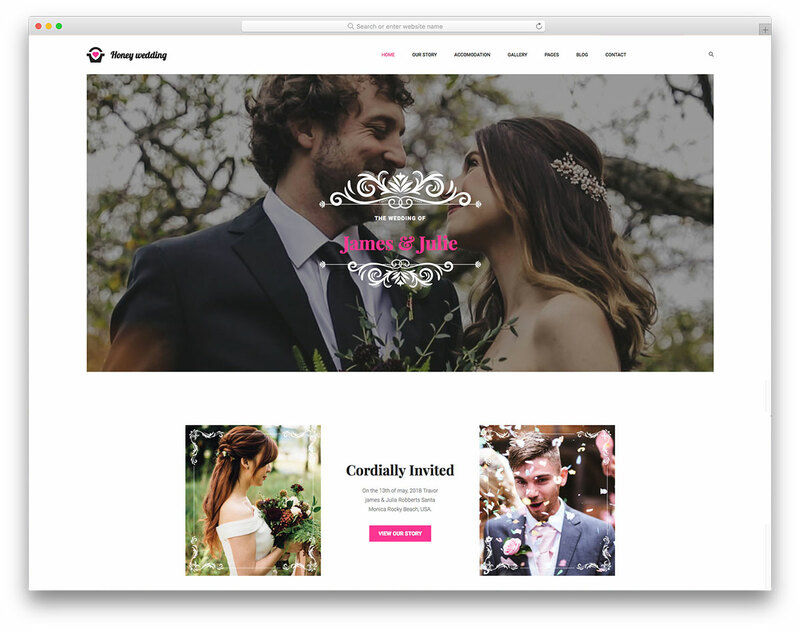 Honey is everything that you need when you are looking to bring into being a wedding website. It provides an opportunity to truly shine online and send out a different type of an invitation compared to what we are all still used to seeing. 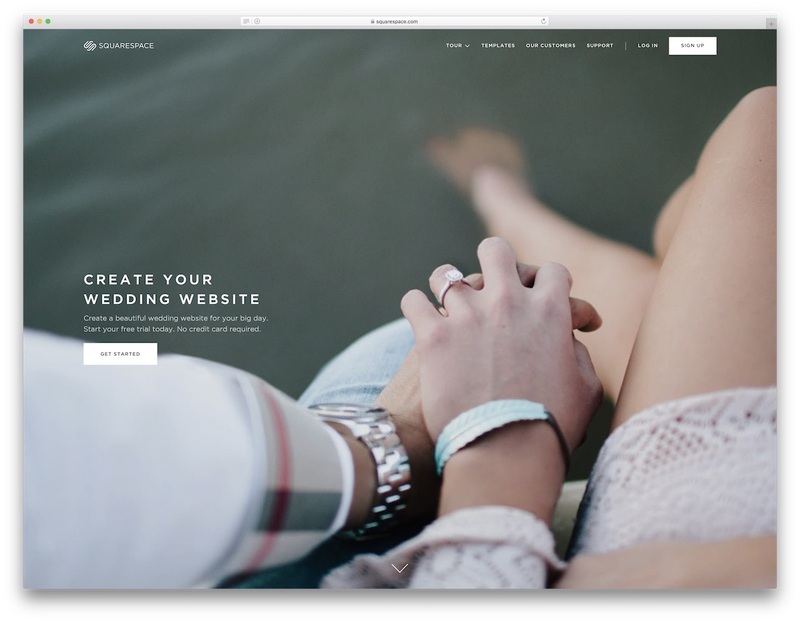 Instead of a card, you can send them a link to your page and take them on a journey through your nuptials early. This free mobile-friendly website template has all the necessary and then some for a tempting, adorable, yet professional, web space. Lovely banner with parallax effect, countdown timer to use for the big day announcement, cool love story section and an active reservation form, it is all there. Moreover, Honey has a ton of other goodies that will do you well. Unique timetable, gift registry section, gallery and exclusive pages for bridesmaid and groomsmen. Starting a blog is possible, too, for you to go in-depth with your wedding preparation and all the rest that you would like to share. 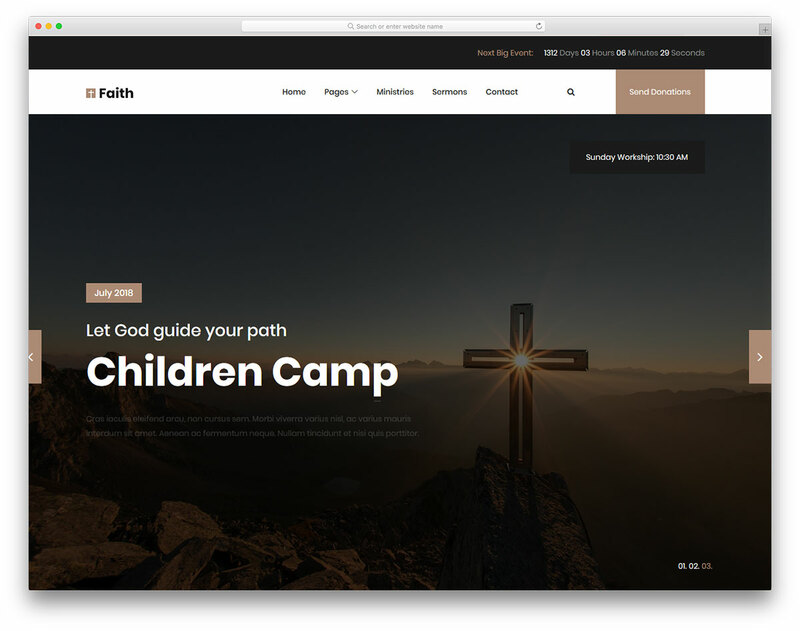 When looking for a template to set up a website for a page or other religious institutions, Faith 2 will do the job right. It is a free mobile-ready website template with all the must-have features and assets to get your online space going as soon as possible. As a matter of fact, you can do it super fast since the majority of work has already been done for you. All you need to do is to change and edit the existing look with your stuff and you could be ready to go. Faith 2 is clear to use and customize to give you an opportunity to produce the look that you want for your church. The site skin has many cutting-edge goodies to offer. Before you notice, with just a small investment of time and effort, you can have a fully functional page live, pushing your sermons and the God’s Word. Construction and building companies are more than welcome to approach the online space with a refreshing website using Builder. It is a Bootstrap-based tool that follows all the latest web and tech regulations. 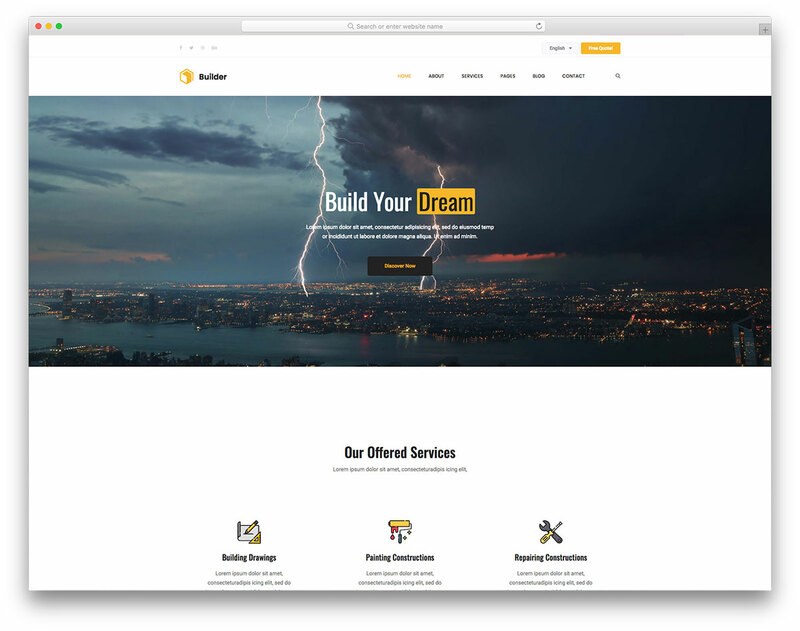 That said, not only will be using and working with Builder effortless, but the end product will also be a professional web scheme for marketing your products and services. With Builder, you will keep things neat and tidy on the net. The design it rocks is minimal and smooth with an emphasis on your works and offerings. Builder is also fully translatable, comes with a newsletter subscription form, social media links and an entire blog section. 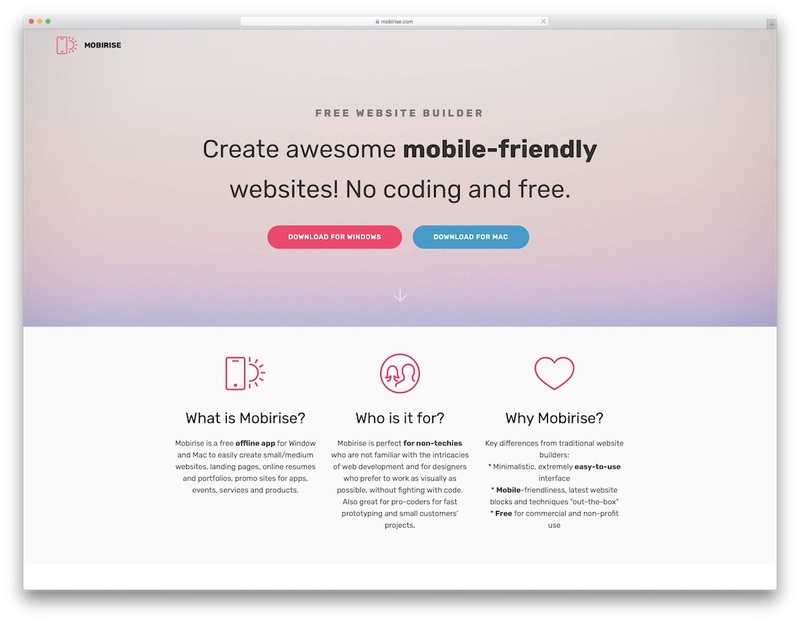 Of course, Builder is a free mobile-friendly website template so you can download it right away and start using it immediately. Moreover, your final website will perform great on all type of devices, as well as major web browsers. No matter what your app is, you need a free mobile-friendly website template to take care of your online presence. One such tool is Appson. A simple name for a not so simple tool. But not in regards to using and customizing it. 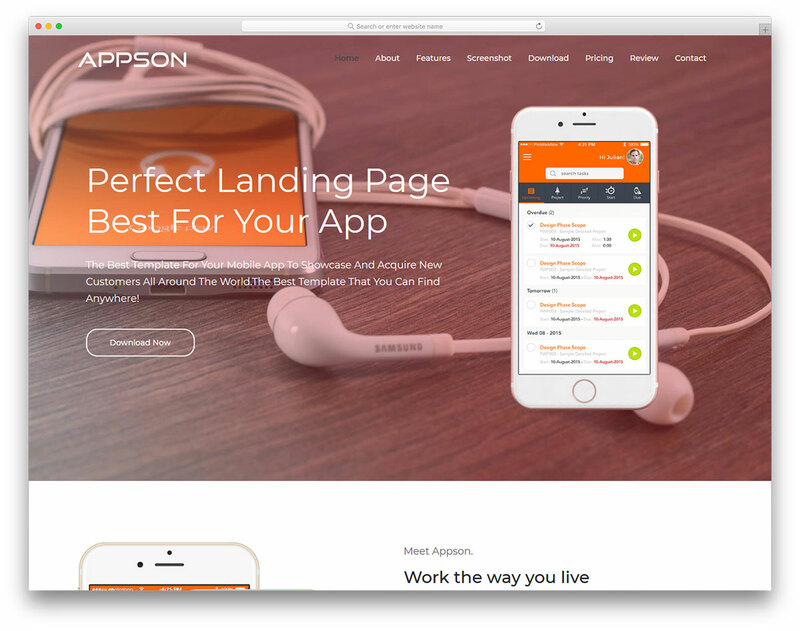 What you will notice is that Appson is a big template with a ton of predesigned content for your convenience. Just with the seven ready-to-use home pages alone, you have many different ways you can pursue. Slider, gradient, video, image, raindrop, you name it, all these special styles are at your disposal. What’s best, no matter which home variation you decide to go with, the consequence will always be a remarkable web design. Appson has a contemporary look, sticky navigation, pricing tables, excellent screenshot slider, call-to-action buttons and a contact form. You can also display what your users have to say about your app and start a blog to implement content marketing for the extra boost. If you run a business related to cryptocurrencies or you plan on starting one, you better look into Cryptos. This free mobile-ready website template has a great deal of traits and solid characteristics that you can take to your advantage. No need to be making your page from the ground up when you have such killer tools at your fingertips. Meaning, download Cryptos now, improve and customize it to fit your branding and you are good to go. Cryptos does not require any too advanced stuff that you would not be able to accomplish yourself. As far as the technical part goes, Cryptos is powered by Bootstrap and all the new-age technologies to provide flexibility and ease of use. On top of that, the template is also optimized for search engines and speed. You can be sure that your website will work seamlessly all the time no matter the device and platform they come from. And search engines will love it, too. 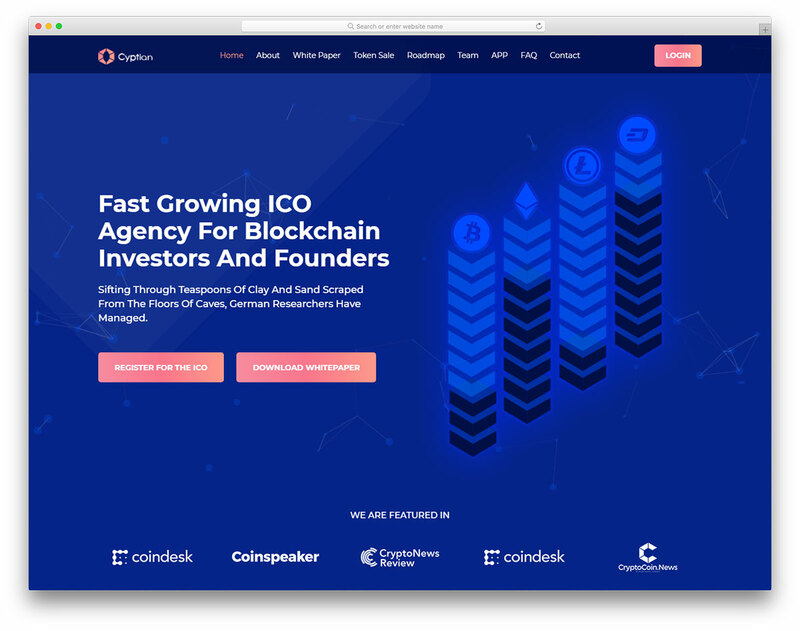 For an ICO agency website template, Cryptian is one of the best free mobile-ready website templates currently available on the market. Instead of doing your thing from scratch, you have it all at your service. Just utilize what Cryptian brings to the table and you are closer than ever to realizing your much-needed website. Bring your agency to a whole new level and reach people and potential clients all around the world. It is a website that will help you market yourself as pros do. Cryptian comes with two index pages, a blog and all the other necessary segments. Speaking of which, there are about, team, contact, FAQ and white paper section neatly packed into a single-page layout. 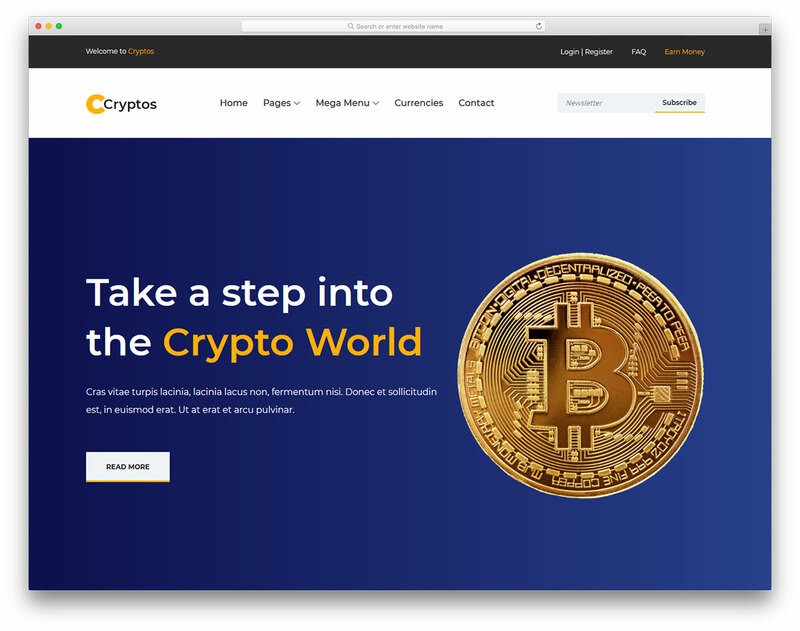 That’s correct, Cryptian is a one-page website template so that your guests do not have to visit several pages first before they decide to work with you. In Cryptian’s case, they have it all on one page for their convenience. Whoever would like to enter the coin market space without an agency or a product, Newsbit is here to give you a different option. If you are following the industry for some time now, chances are, you know quite a lot about it. Why wouldn’t you want to share all your knowledge with the world and help those get familiar with what Bitcoin and cryptocurrencies actually are? Or even expand your offering and share different industry news and whatnot. 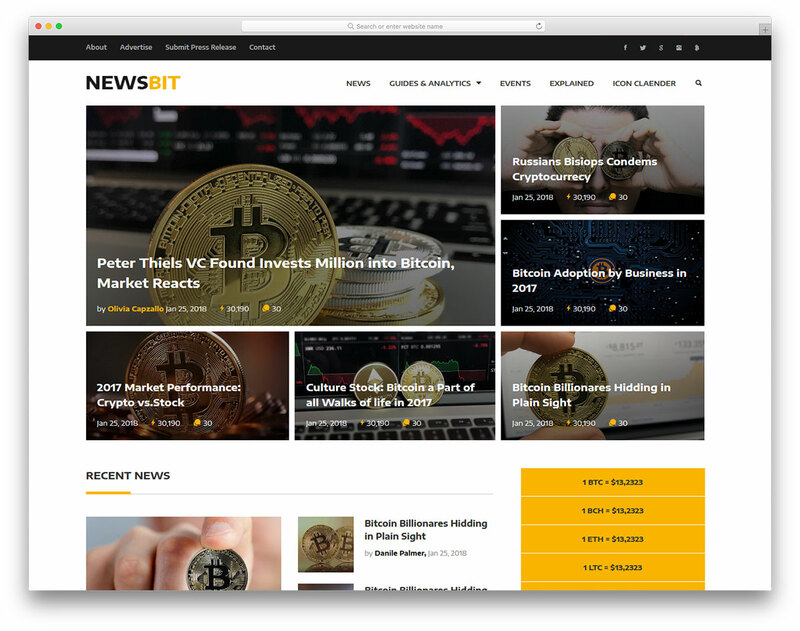 To start a cryptocurrency blog or online magazine, Newsbit is here to get things moving. It is a free mobile-ready website template with a minimal and nifty web design that will spark everyone’s interest. The look allows you to scan through topics quickly and further investigate only what truly interests you. Other than that, Newsbit is retina-ready, SEO optimized, simple to modify and functions smoothly regardless of the device and web browser. Sports, fitnesses, gyms, yoga studios, you name it, a website to push your programs and classes is a must have. If you lack a solid web presence, make an end to it today and use free mobile-ready website template, Flawless. Not only does it cost you nothing, but Flawless is also simple to utilize, edit and enhance with your individual touch. Instead of spending too much time on the design and development of your website, you can now do it effortlessly with Flawless. 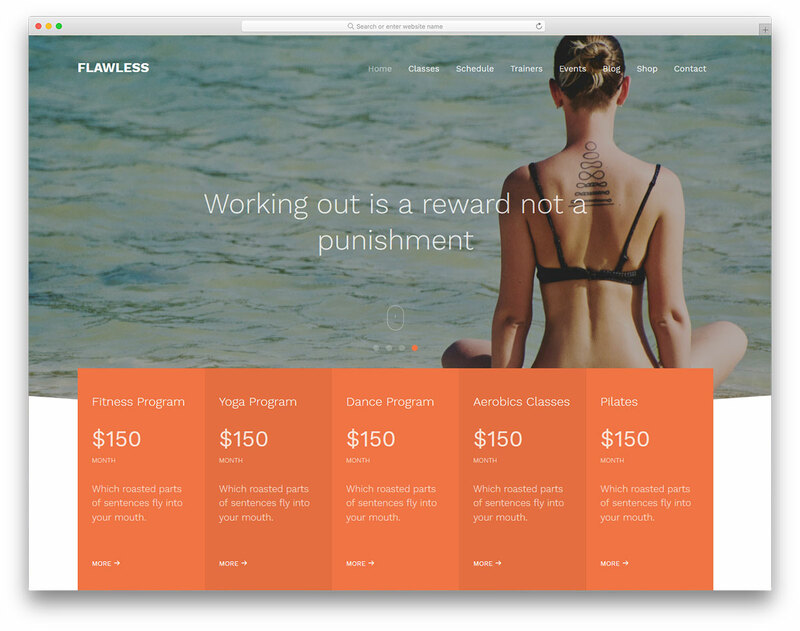 Full-width slider with classes tables, on scroll content load, weekly class schedule and parallax sections are some of the assets of Flawless. Moreover, the tool is also fully shop and blog ready and provides two special inner pages for classes and trainers. Without further ado, hit the download button now and start doing magical things with Flawless. 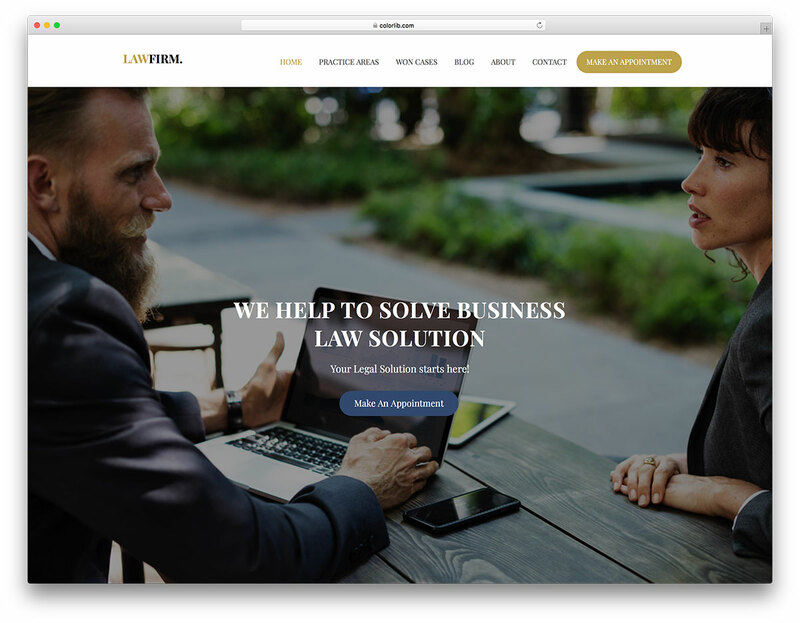 Lawfirm, hence the name, is a free lawyer website template with a modern and slick look to it. While it was created with an emphasis on lawyers and law firms, you can also use Lawfirm for financial companies and other consulting businesses. It comes with a neat home page design and several other inner pages which you can improve to your likings. 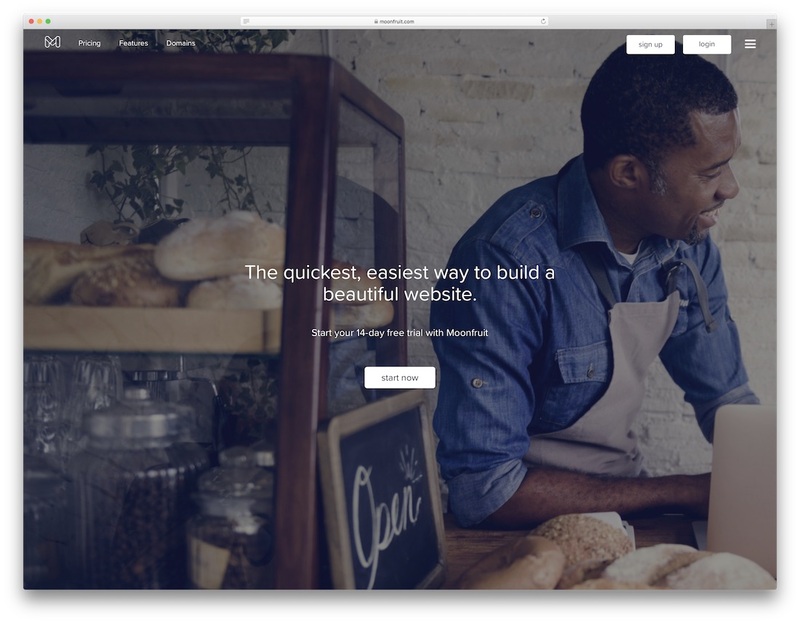 With a full-screen slider, you will impress every visitors and make them hungry for more. Animated stats and parallax effect spice up the experience while the working contact form gets them to access you straight from your website. Have your appointments taken care of automatically, start a blog and introduce your attorneys. Just short moments later and you will have a fully functional website up and running. 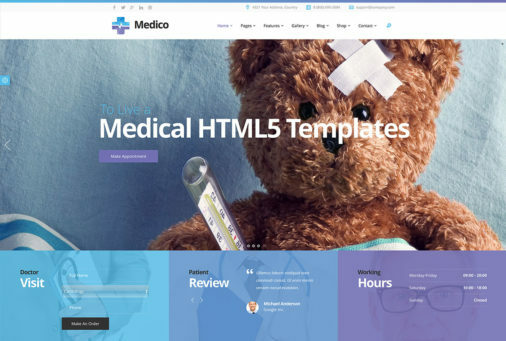 Medical is a free mobile-friendly website template for those running a healthcare or medical business. To be more exact, Medical is best suitable for dentists, veterinarians, surgeons, physicians and other doctors and professionals. It is a super clean and straightforward medical website template that is easy to customize. A full-width banner welcomes every new user and current client and gets them introduces to your clinic or doctor’s office. The dedicated section to list your services provides enough information to let them know whether you are the right address for what they are in need of. Further down the page, clients interested to make an appointment can use the booking form and get a prompt response from you. There is also a subscription box in the footer for everyone who would like to subscribe to your newsletter. May the name of the next free mobile-friendly website template not deceive you. 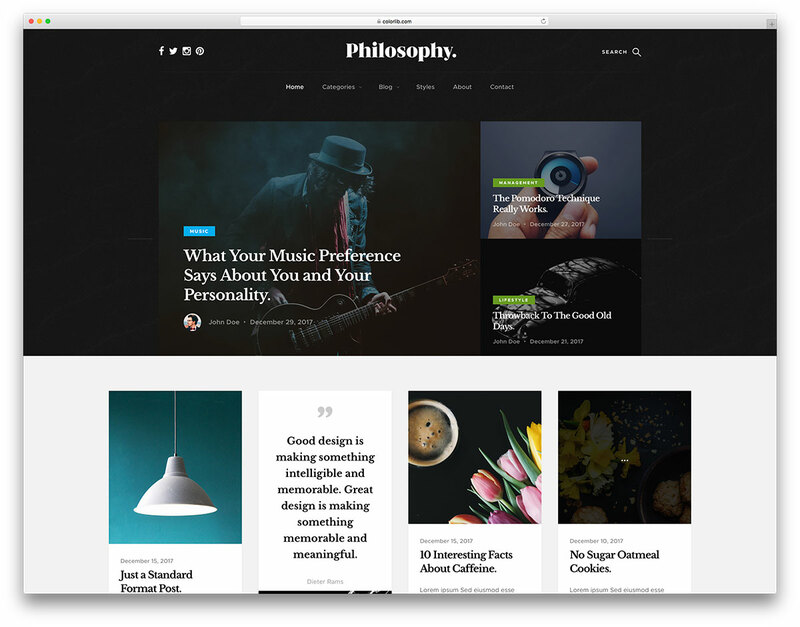 Philosophy is a free blog template with a stunning grid layout. It works well with lifestyle, fashion, food, DIY, design, creative and almost any other type of blog. It is only a matter what type of content you use with Philosophy and it will instantly adapt to your niche. Yep, it is that simple. Philosophy template has an excellent navigation with a drop-down menu, the articles load on scroll and the footer section has a nice selection of widgets. Besides the standard, it supports video, audio and gallery posts of which each allows comments. There is also a back to top button, social media icons and a newsletter subscription widget. 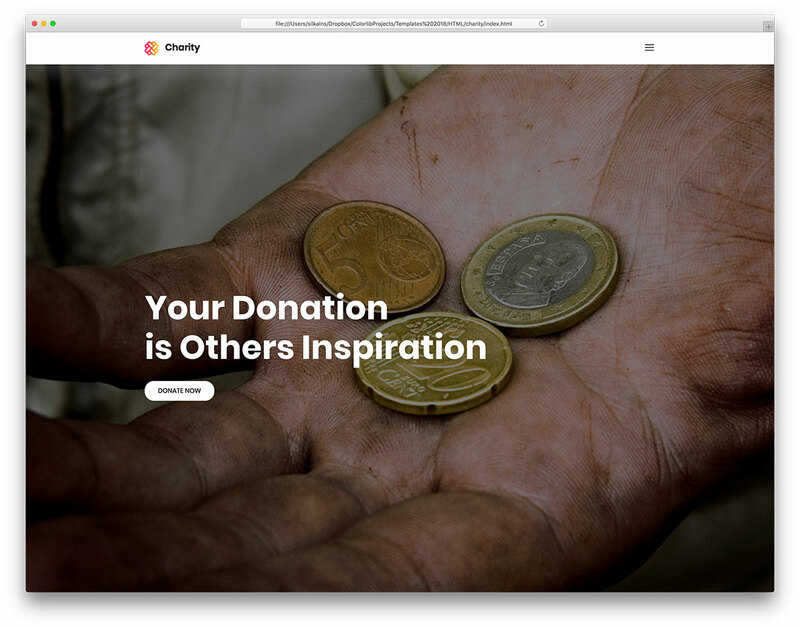 If you are building websites for non-profit organizations and charities, Charity is a beautifully designed charity website template. With a few tweaks and improvements, you can also make a website for churches and the like. Charity might be a free mobile-friendly website template, however, free does not mean poor in quality and flexibility. Charity sports both and they just happen to be of the highest standards. What is one of the most crucial parts of every charity and non-profit website is collecting donations. In the case of Charity template, you do not have to worry about how to execute your forthcoming donation campaign. It has a working donation form integrated into the design so you do not have to build one on your own. For single event pages or event and conference organizers, Eventasia helps you develop websites for the big meeting you are hosting. Get more people to attend the gig with an enticing website that will make the event even more attractive. It will be impossible for them to visit your page and walk away without adding the event to Google Calendar. Of course, they do not want to miss it! 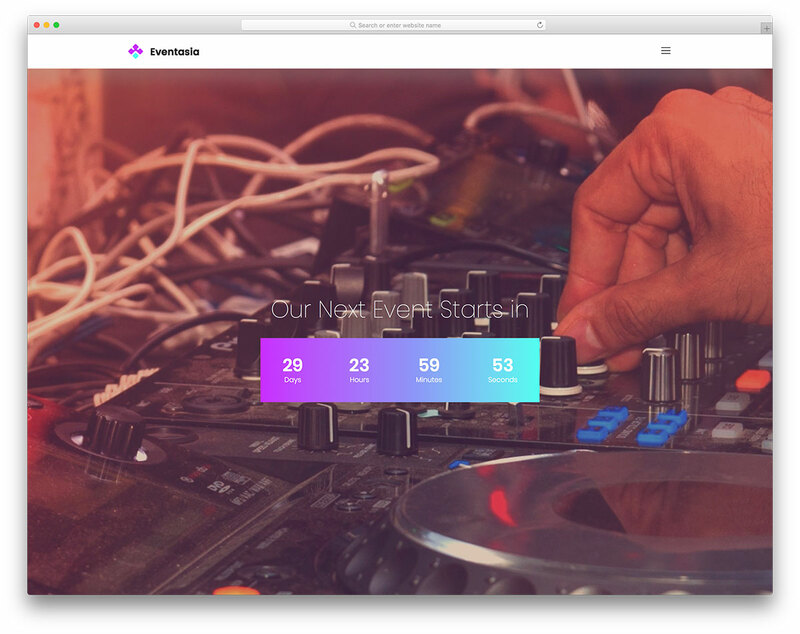 Eventasia is a free event website template with all the necessary elements and sections that such a page needs. It has a countdown timer, event calendar, exclusive section for speakers and all other useful characteristics. The shortest description would be: Eventasia is the ultimate and responsive website template to help you host your remarkable events. More material for those in the medical and healthcare industries. 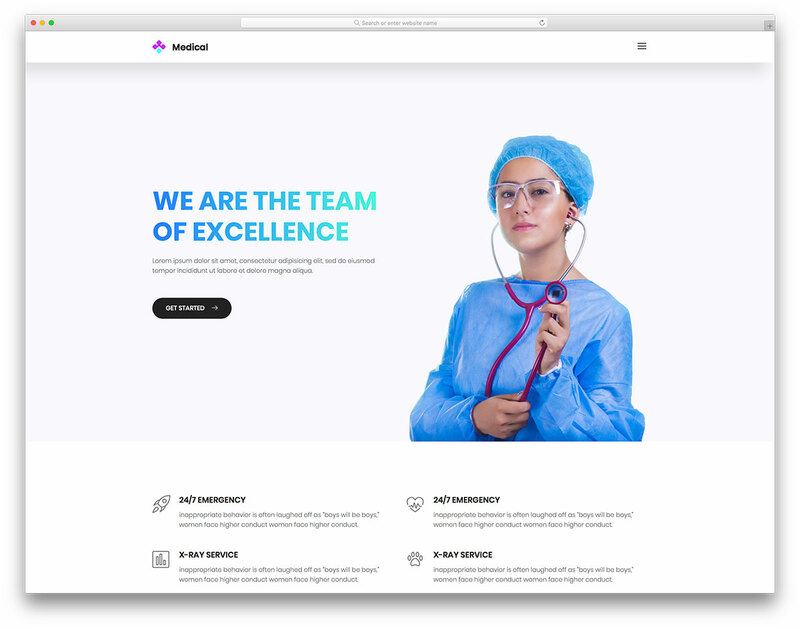 Medi+ is an entirely free mobile-friendly website template with an elegant and easy on the eye web design. It suits building websites for clinics, doctors, dentists, chiropractors, surgeons and other professionals perfectly. 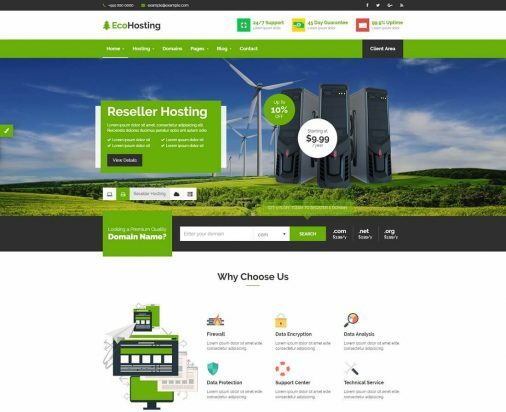 In a breeze, you will have an outstanding website ready either for your business or for your client’s business. What is great about Medi+ template is the fact how compliant it is. You can use the free tool for ten different clients easily. 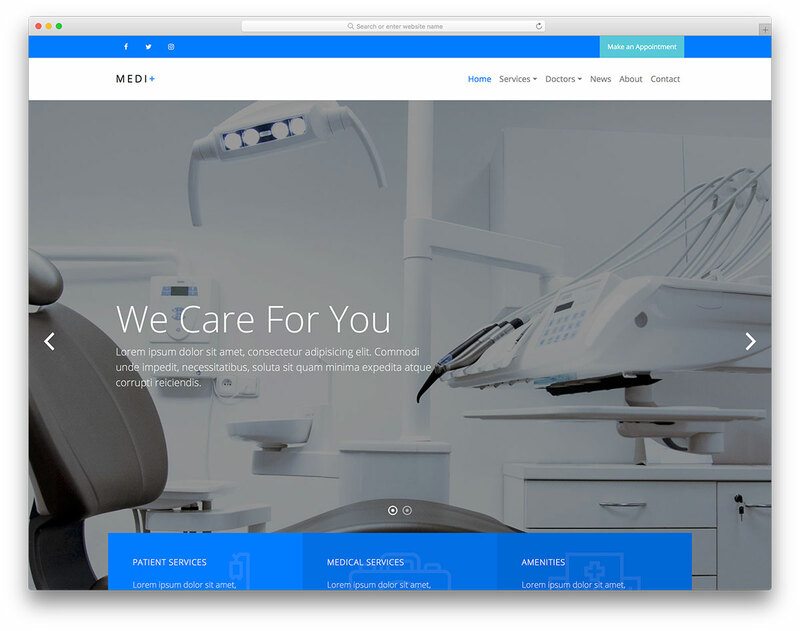 Without facing any challenges, you will make it fit every owner to the T.
If you need another idea for a medical website, Medi+ is a great item to start with or find inspiration in. You only need to check the image above and read the name and you already know what you are in for. 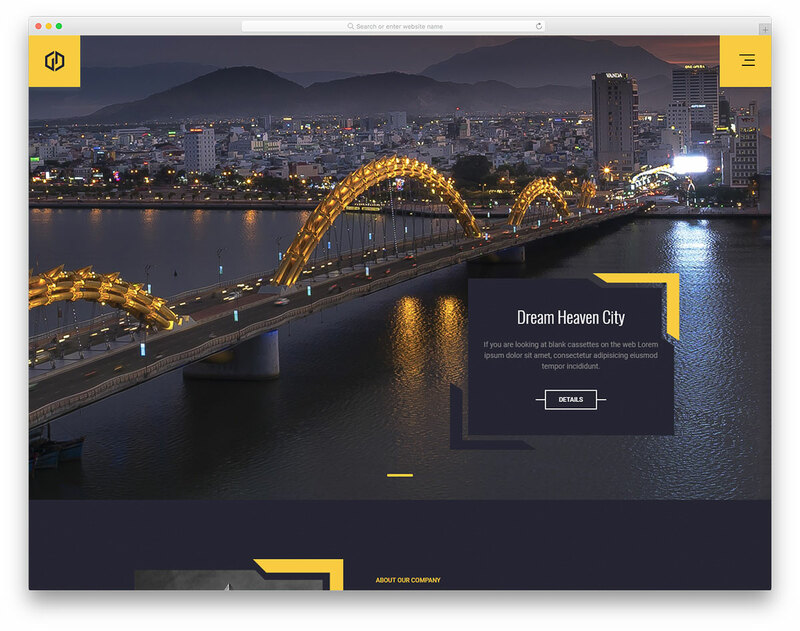 Travelasia is, you guessed it, a travel website template with its focal point being hotels, travel agencies and holiday resorts. But truly, you can use it with a broader specter of travel websites and even other industries that need to feature booking options on their websites. A massive banner with text and call-to-action button, booking system and a special section for your attractive packages, Travelasia template has it all. And if the client does not find what they are looking for, he or she can use the contact form and customize their trip however they want it. Travelasia also has integrated Instagram feed, social buttons and newsletter widget. 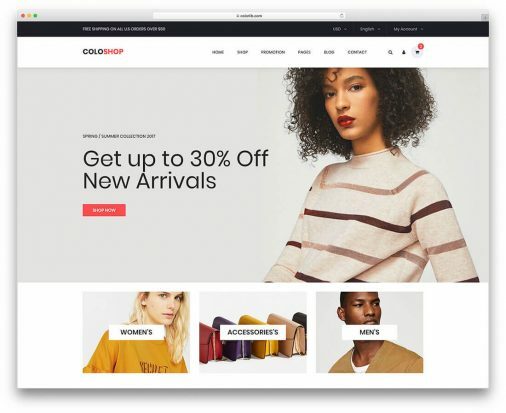 Do you plan on building an online store but you do not know where to start? The best options for you is to start with free ecommerce website templates. Not only you need to spend no money on them, your final web design will look way more professional than you think. If you are still in doubt, you better check free mobile-friendly website template, E-Shop. It is an advanced template that will help you create a wide variety of online stores. It is clean and minimal what helps you adjust it to your needs quickly. Big images, sliders, visible text and solid navigation, E-Shop template delivers all the needed and then some. And you do not have to worry whether shoppers browse your store from a smartphone, tablet or laptop. 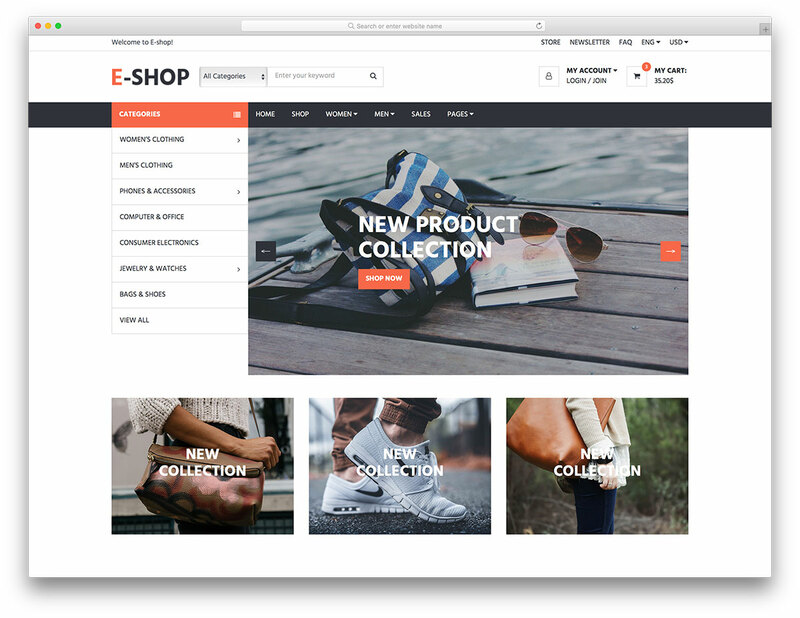 E-Shop’s layout is 100% responsive. As a hotel or travel agency owner yourself, you, unquestionably need a website. You are simply living too much money on the table if you still have not sorted out your online appearance. Even if you are using 3rd party platforms, an official website for your boutique hotel will do you well. 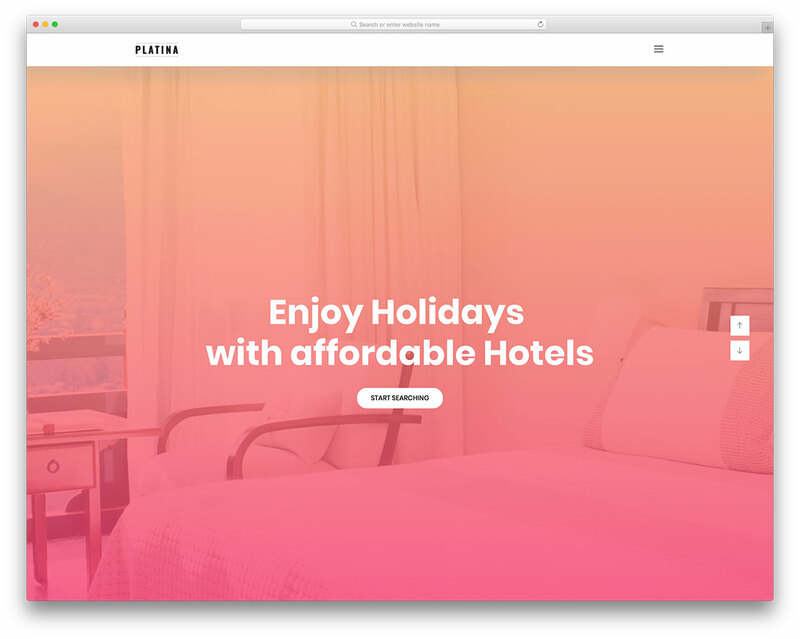 Platina is the free hotel website template with a fluid layout that perfectly adjusts to any screen size. Furthermore, the template has a smooth web design to showcase your hotel, rooms and all the rest in the finest way. Start luxuriating your new visitors with your website and pre-sell them before they even start scrolling. FYI, a big banner with text slider will have them hooked straight away. They will be rushing to the Book a Room section where Platina template treats the visitor with a simple to use booking form. Fashionistas and pretty much everyone that has something to do with the fashion industry, start a project that you always wanted to launch with Fashion template. Let’s further investigate this free fashion website template and get more specific who it is for. To kick it off, Fashion template is for fashion designers, clothing brands and even model agencies. Of course, you can, more or less, use it with any other niche website related to the apparel industry. Promote your new fashion line or get companies familiar with your talented models. Whatever you do, Fashion template will help your website and project to stand out from the crowd. Musicians, bands, radio stations but really, everyone who is in the music and entertainment industry, Music is the free mobile-friendly template for you. The template comes with many cool and beneficial features that will help you distinguish yourself from the masses. It all starts with the immense banner which you can use for your band photo. Choose the image wisely since it is the first thing that a visitor sees. Create a strong first impression and score yourself a new fan. That’s very likely to happen if you use Music template. With features like parallax effect, video support but for the most part, nifty web design, all is very possible. You definitely should not miss Music if you are in to bring about an attention grabbing website. 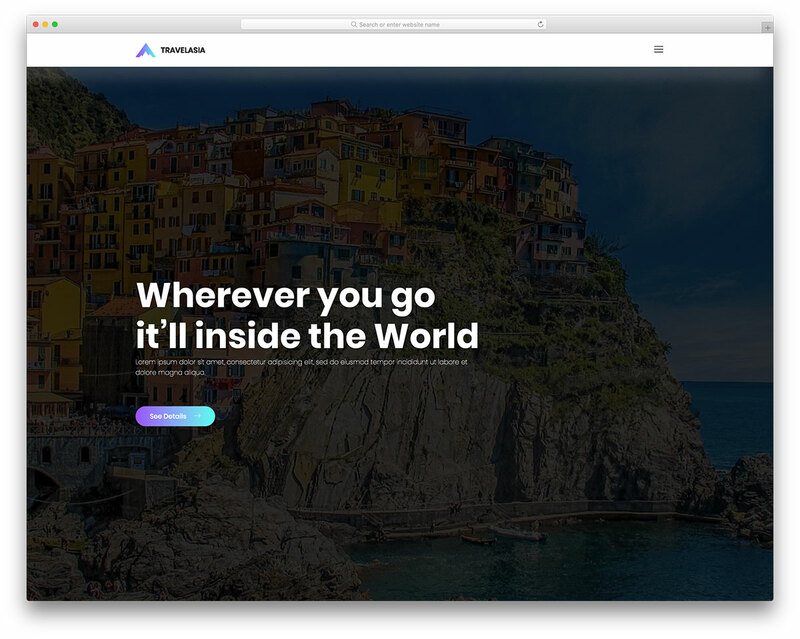 One thing is for sure, when you see Glint free and responsive HTML website template in action, the free part mysteriously disappears. It looks more premium than free and that is something super rewarding for you, the user. 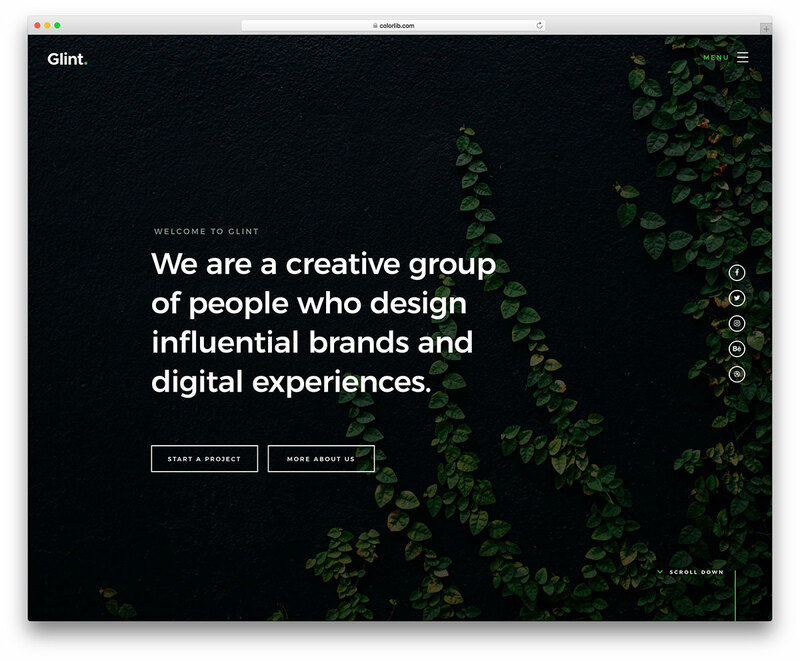 With digital agencies and freelancers in mind, Glint is an item that will create a memorable website. But most importantly, help you grow your business by promoting your services and works in an enviable way. Glint is a retina ready layout with marvelous features. You will find animated stats, parallax background, functional contact form, on scroll animations and a cracking portfolio. On top of that, Glint’s code is well organized to make customization feel undemanding. Take action and do something remarkable today. 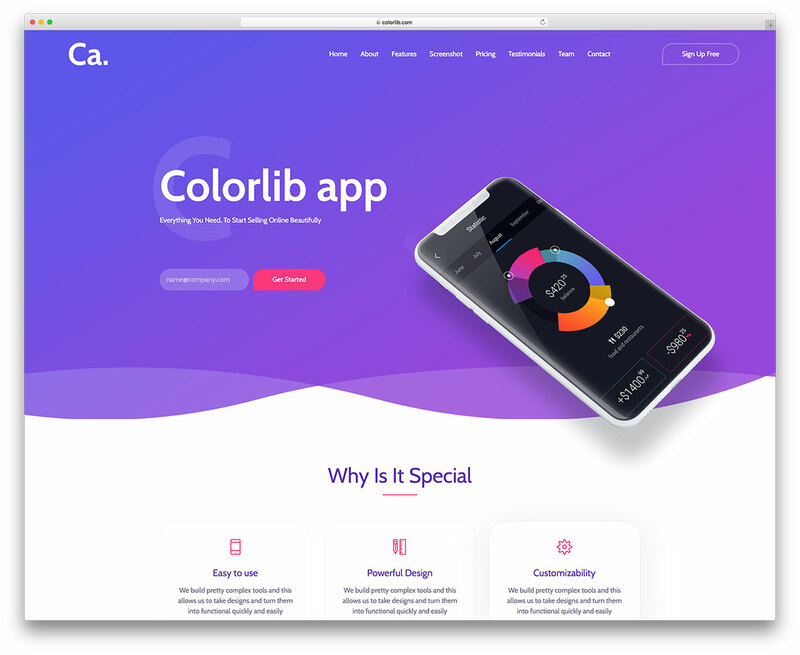 If you are testing the waters or need an inspiration, CA App Landing free mobile-friendly website template is one to take into consideration. With this type of a landing page website template, you surely will get the most bang for your buck. However, the only thing you need to invest into setting up a website is your time and effort. No money! CA App Landing is an ideal product to display your iOS and Android mobile application and can even work as a SaaS website. Contemporary template with some cool features and handy predefined sections. Pricing tables, app showcase, footer reveal and sticky menu, CA App Landing is packed with goodies. For as cheap as free, you can have a website up and running in the shortest space of time. 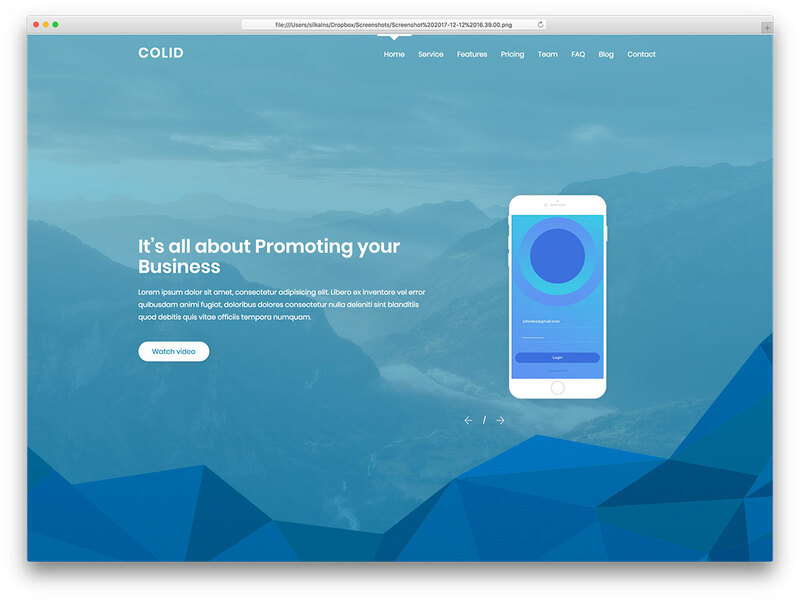 Built using the latest technologies, Colid is a responsive, mobile-friendly and extremely flexible template. 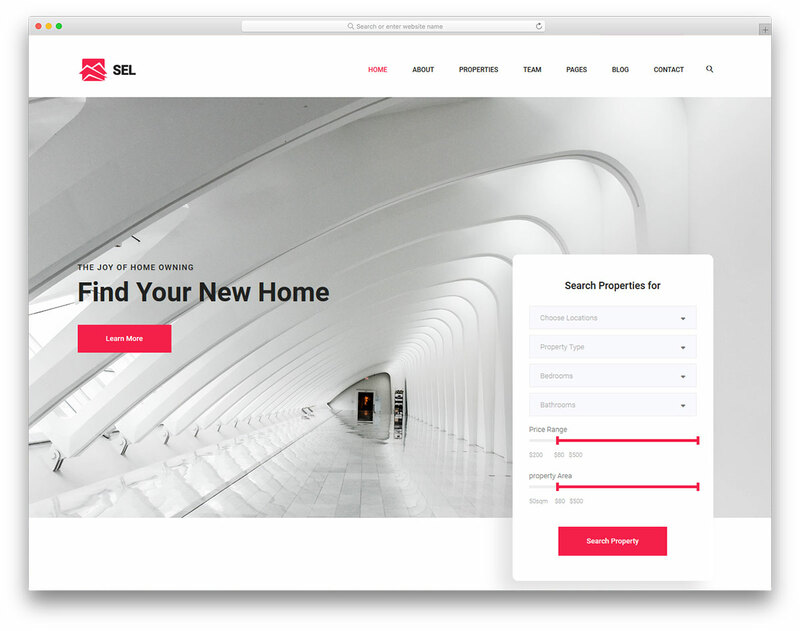 Though its focal point are iOS, Android and Windows apps, plus SaaS, you can modify this one-page website template with ease to follow other projects, too. Colid rocks bright colors and a modernistic look which will make your product appear even prettier than it already is. Have your web presentation deployed in its entirety with an excellent free mobile-friendly website template. Transparent menu that transforms into a sticky one, awesome services section and pricing tables will boost your clientele through the roof. You can even begin blogging and use insightful articles for content marketing. Colid might not cost anything but that does not mean features are few and far in between. There are loads! Creative individuals and agencies, Boxus is the unique free website template that you will be hard to hold back and not build a page with it. But why even distancing yourself from it? Just like Boxus, all other free mobile-friendly website templates are ready to put them to use straight away, no need to be opening your wallet. 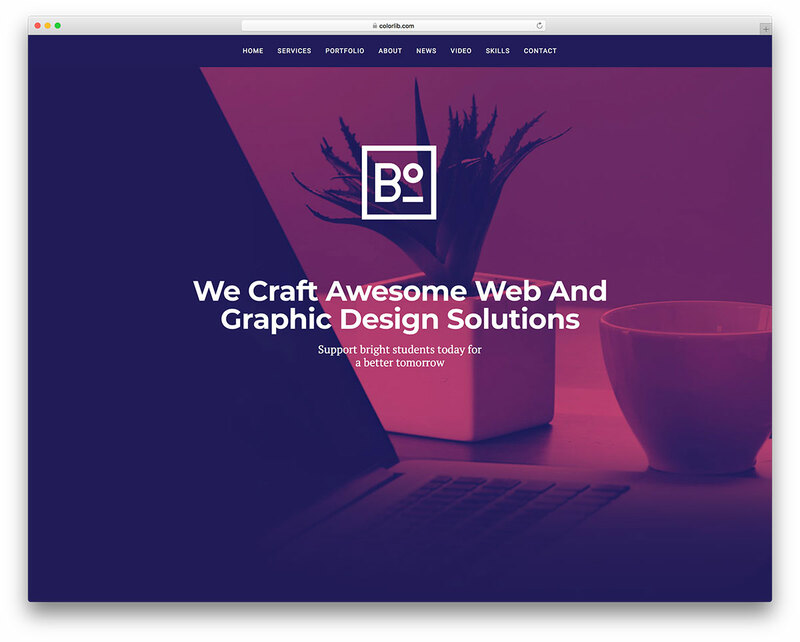 Boxus is a jaw-dropping template with a mindblowing web design that sparks interest in just about everyone. Great idea behind the layout makes it a stand out product that everyone will be excited to browse. Tempting portfolio, blog, contact form, Google Maps and other qualities make Boxus a special template. But the best way to get a piece of Boxus is to check out the live preview. 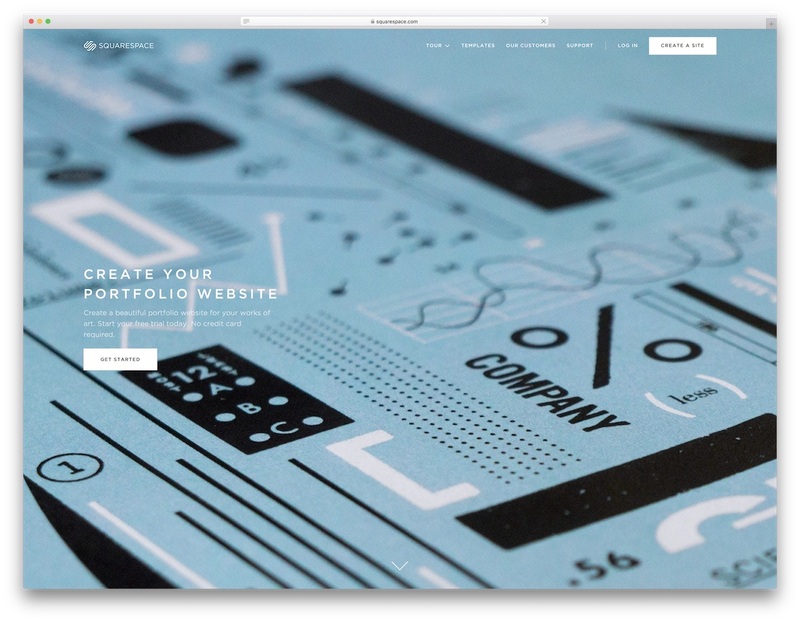 For photographers and artist, as well as other creative minds, Pemodule is a free portfolio website template. It is one of those items that have quite a basic, yet bold, approach to web design. But it is the simpleness what makes Pemodule appealing to the eye. Of course, the colors are eye pleasers, too. With that in mind, all your works will appear stunningly and beautifully. Make visitors hungry for more and get them to return tomorrow for added visuals they cannot live without. 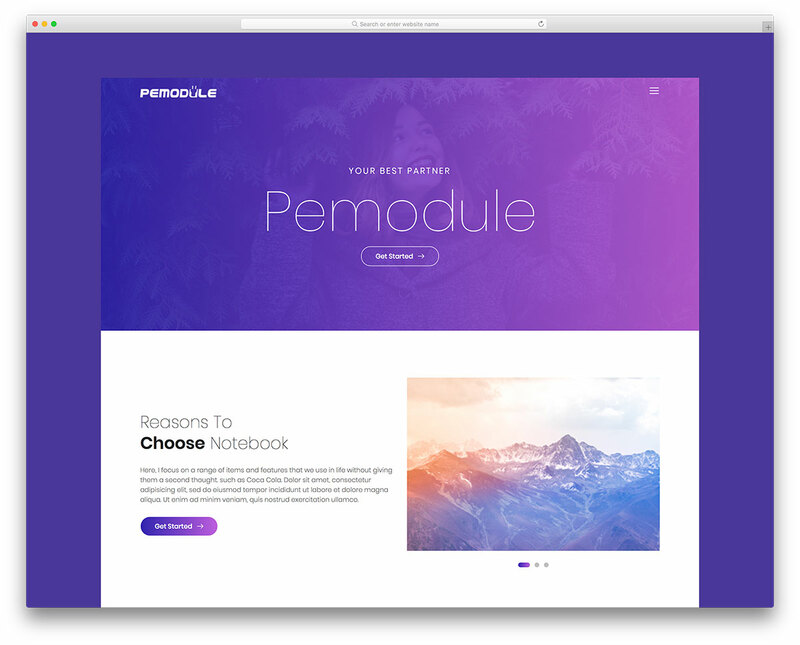 With a banner and a call-to-action button along the quick introduction with a slider, parallax effect and the portfolio, Pemodule keeps things very quintessential. But that is always a good thing since you do not want too many distractions on your page instead make your pictures to stick out. 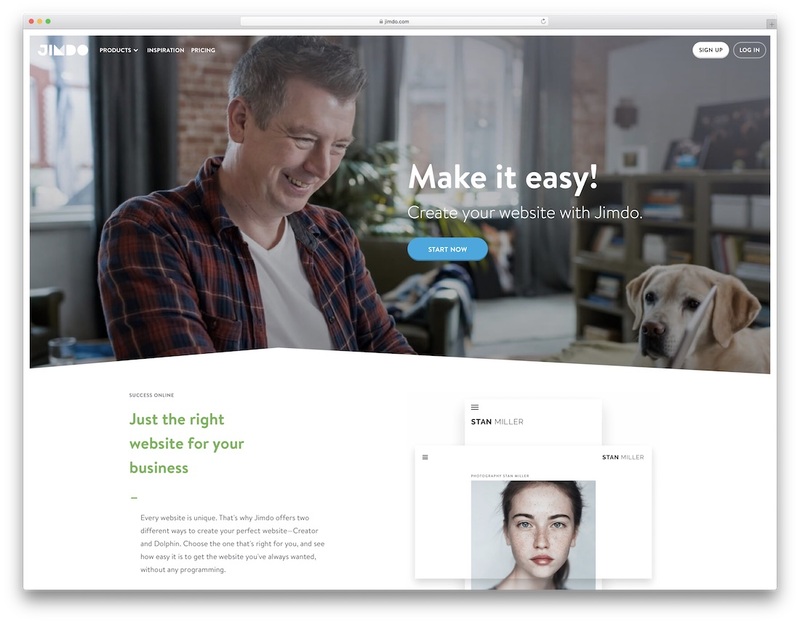 For small businesses and even personal pages, Blueline is the free mobile-friendly website template you might consider. There is just the right amount of stuff going on to keep the visitor around for a while. With the full-screen hero image, guests will get hit with a magnetic first impression. It is so inviting, it is impossible not to check what’s the page all about. And that is a big plus for you and your business or any type of online project. 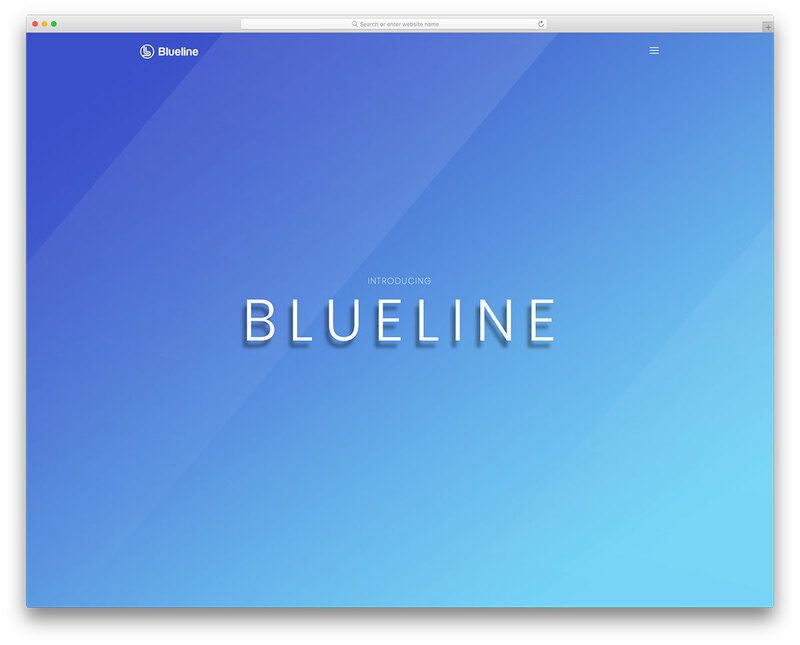 Indeed, Blueline template was created with usability and top-notch user experience in mind. Mobile and tablet users will love your page since it will work smoothly on their device. Taking a peek at your work (Blueline supports videos) will turn visitors into clients in a snap if all will be executed correctly. CellOn is a consulting website template that helps you form a strong first impression and leave them in awe. How does the template acchieve that? It is the minimal approach CellOn has on its look. But it is the color choice what truly calls for the unique experience. Businesses offering consultancies and coaching are just short moments away from realizing their websites. With a free and responsive website template, like CellOn is, your website will work flawlessly at all times. Quick and efficient to customize, animated statistics and the color green fill CellOn with life. 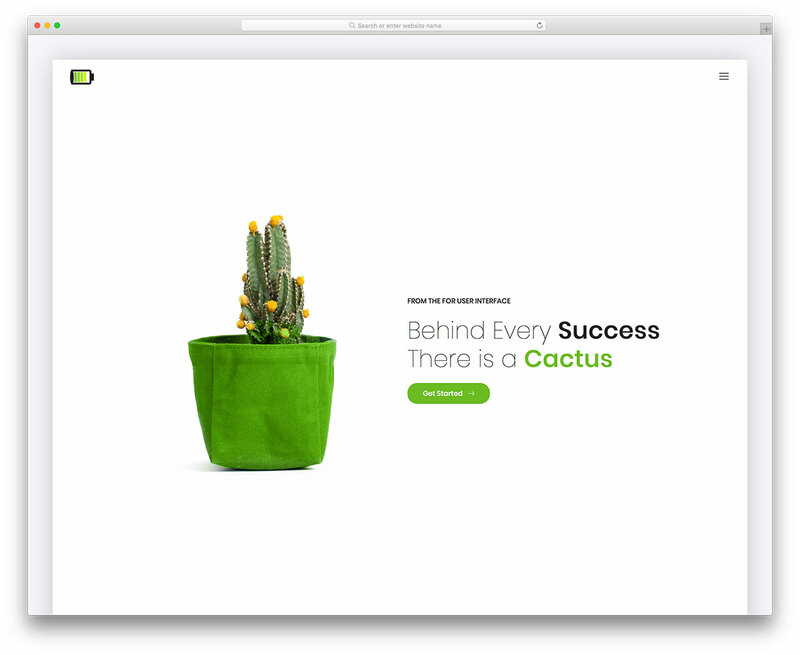 If you are a cactus fan, CellOn is the one template you need. There are many reasons why Fancy template is named the way it is. It is not just because the name is cool. There is a lot more that this free mobile-friendly website template has in store for you. Of course, we need to begin with the design. It has a professional and very premium look to it that is for sure. 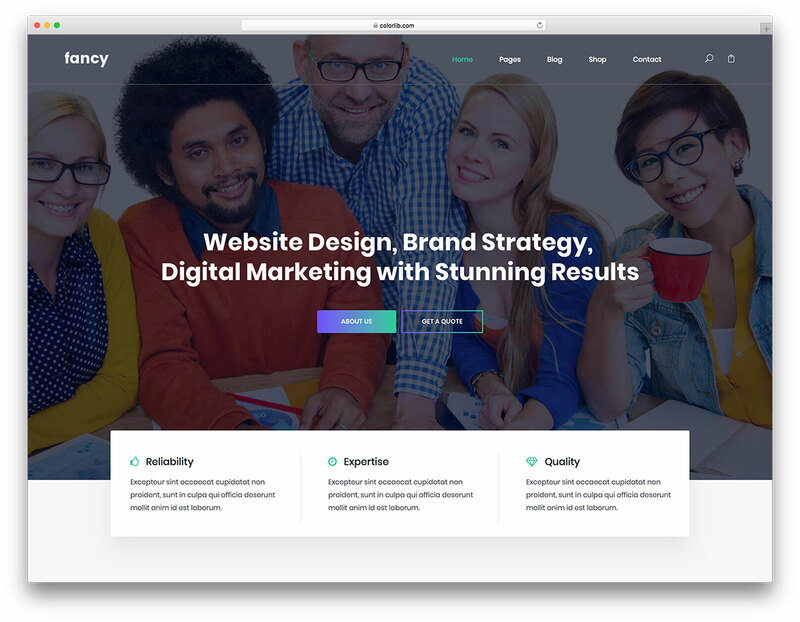 Moreover, Fancy is perfect for agencies and small and medium businesses. What industry is the template for? Let’s just say that Fancy is for any industry. Seriously, the design is highly adaptable but it is the customization capabilities of the template what will help you adjust it to your needs. Fancy template’s home page is carefully designed to guarantee you an impactful online appearance. Besides, it has other pages, like blog, and fully supports expanding your website with an online store. 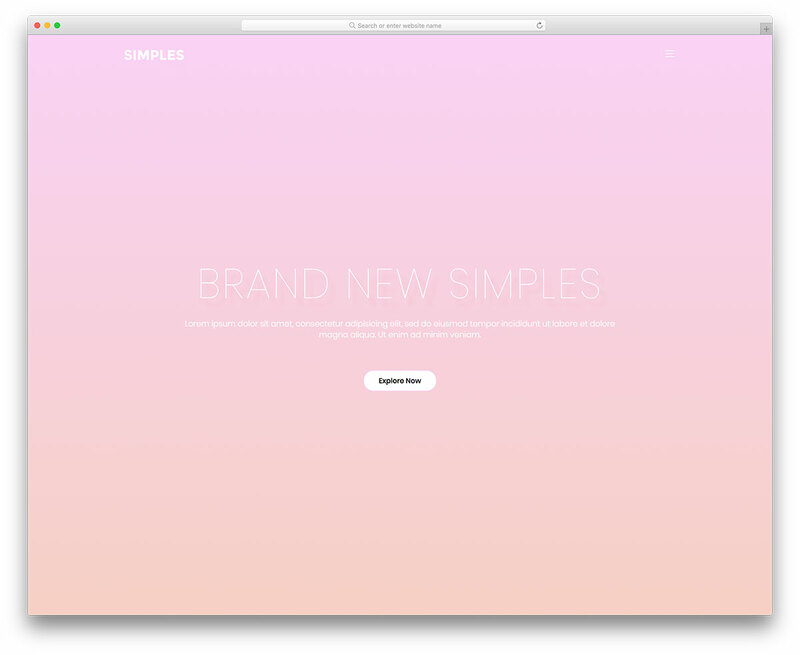 Simples is a no-frills free feminine website template for the businesswomen. The colors are soft, the layout modern and clean with just the right amount of features and sections to not overwhelm the visitor. Simples can create fully working websites for photographers, yoga studios, artists, creative agencies, restaurants and almost any other type of business. It is the simplicity what helps Simples instantly acclimatize to different niches. And that is a positive thing when it comes to finding the right template that can cover various topics. It is the full screen image with title and text plus a call-to-action button what hits the guest first thing. More killer features follow to bring into being the ultimate feminine website. To differentiate yourself from the masses, Droppler template is the answer to lots of your questions. It is one of those mobile-friendly templates with great emphasis on your content. 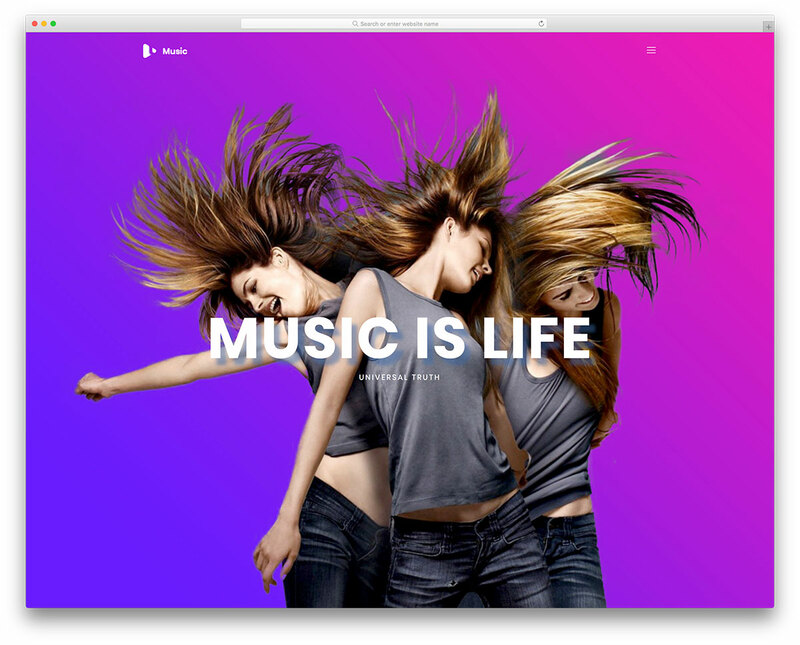 Droppler is a full-screen website template that every creative will adore through the roof. 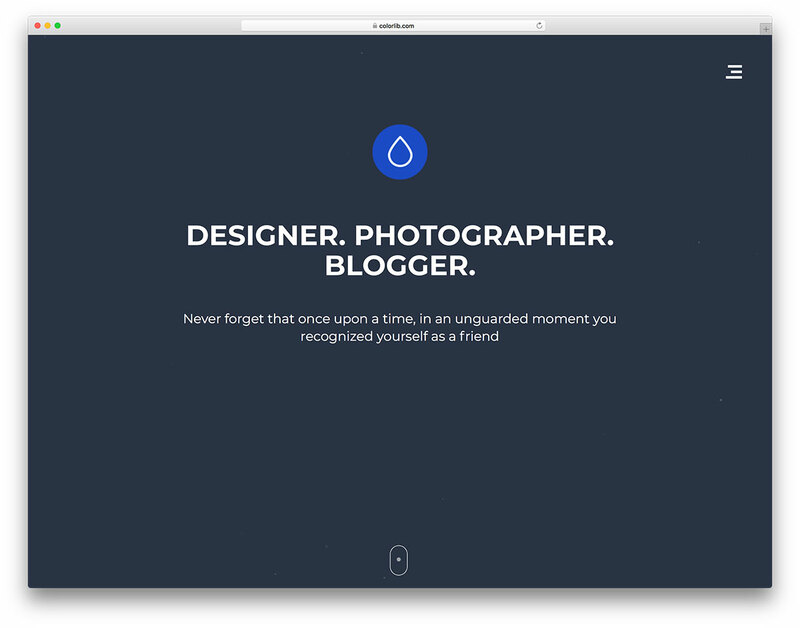 To be more exact, bloggers of many niches, photographers, artists, designers, yes, you can all use Droppler. That is going to be one head-turning blog you are about to craft with Droppler. For more proof, feel free to first inspect the live preview. It is simple, full-width and unique, that is Droppler. Smooth scrolling, video support, next and previous story buttons, search option and comfy navigation, Droppler is exactly what you need. Besides, you can expect a few extra toppings to help you galvanize them into action. How much are you enjoying our best free mobile-friendly website templates so far? Do you need a template for your schools, universities and everything else education-related? It might took you a little while to come so far but finally, you are here. Edusite is the free template that will take care of the creation of a valuable website. 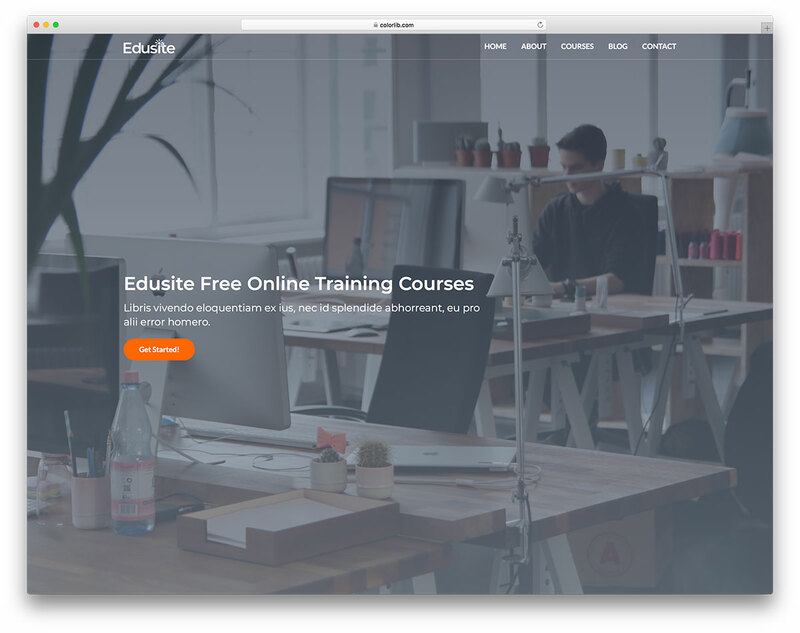 The web design of Edusite is straightforward, minimal and full-screen. If online courses is what you are dedicating your heart and soul to, Edusite is also the tool for you. There is a ton you can do with it and you will be proud of yourself with the final outcome. By the way, whoever is building an educational blog, Edusite also has a blog section that you can use as a standalone page easily. My search for “Best DIVI mobile-first websites” returned this page https://colorlib.com/wp/page/2/?s=Best+DIVI+mobile-first+websites. That page shows desktop versions – not the mobile-first versions. While I realize that the examples – the demos – are responsive, I need to see a page similar to the desktop versions, but with actual DIVI mobile-first websites. Does colorlib have anything to share that is actually mobile-first? You will be perfectly fine using Divi theme for your website. It is mobile-friendly (responsive) and work perfectly fine on any device. Mobile-first is just a cool marketing term that doesn’t mean a thing for end users. It is popularised because mobile is taking over and no one can say that website is Mac or PC-first because no one uses them anymore. However, all sites are developer on desktop computers and tested there first before moving to testing it on mobile. This is an awesome list of free mobile friendly website templates are very much helpful for developers to make a website. Using these templates you can easily build responsive and mobile friendly website. Thanks for sharing such useful resources with us. Thank you for this great lists, it is all purpose.